Welcome to GoClimb at Billingham Forum! Welcome to the biggest and newest all inclusive climbing adventure to burst out of the Tees Valley. Boasting over 20 unique and exciting climbing walls, each showcasing their own explosive design, plus a 22ft vertical plunge slide, a daring leap of faith challenge and a spiral of rising towers to tackle - and it’s all included in the ticket price! 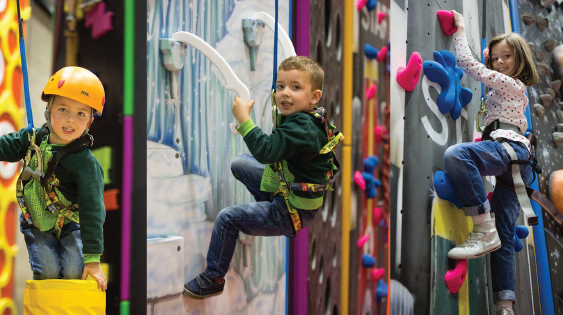 Propel all the family to dizzying new heights and race face-to-face on the transparent Mirror Wall, use ice picks to see if you can crack the Frozen Castle or play your way to the top of The Game without using the snakes or ladders! Whichever wall you try you can be assured that you are completely safe with the auto belay system to gently lower you back to the ground. You don’t need any climbing experience and we’ll provide all your equipment, it’s quite simply book, turn up and let the fun commence. Each 90 minute session will include a 30 minute safety briefing, and then you’re good to go. Try new things, test yourself, laugh a lot and make some fantastic family memories! 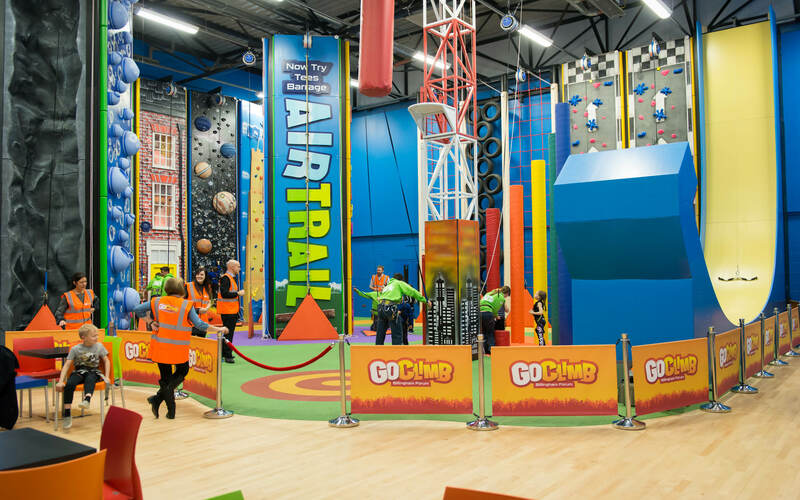 It’s time to lose yourself in GoClimb’s vibrant jungle of crazy colours and gigantic climbing walls and experience family fun at its best. Reach for the sky with GoClimb today! Come rain or shine GoClimb is open all year round and can be booked exclusively for schools, clubs, corporate and team building days and popular parties from 9.00am-10.00pm seven days a week. To book your event or for more information, call 01642 551381. However, opening hours are subject to change and we can get busy so we advise you check we’re open and book in advance so you’re not disappointed. How old do I need to be to go on GoClimb? Climbers need to be a minimum of 4 years of age. Children under 10 must be signed in and supervised by a responsible adult at all times. We have a seating area with tables, chairs and vending machines which is perfect for parents to view all the excitement, while the kids have a great time climbing the walls. Is there a minimum/maximum weight for someone to climb? Yes, the minimum weight is 22lbs (10kg) and the maximum weight is 23 stone (150kg). How long do I get to climb? Sessions start at half past the hour and you’ll be with us for 90 minutes as the GoClimb crew will go through some basic rules and a safety briefing before putting your harness on. After that you’ll literally be climbing the walls for 60 minutes. It can become busy during peak periods so we advise you book to avoid disappointment, however, you can just turn up, but there’s no guarantee that we’ll have places for you. The easiest thing to do is book online, simply select the date you want to visit, choose the session, a number of places and then checkout. You will receive a confirmation email once you have booked; all you need to bring is a whole load of enthusiasm! Alternatively you can pop into the centre or call us on 01642 551381. If you’re planning a birthday party, educational trip or corporate team building event then you need to book in advance by calling 01642 551381 and speaking to one of the GoClimb crew. We only allow trainers to be worn whilst climbing and do not allow boots, climbing shoes, flip-flops or heeled shoes in the climbing zone. Make sure your shoelaces are tied and tuck away any loose ends. Please, also check your shoes are clean. No loose fitting footwear is allowed. Come in clothes that you are comfortable in as you’ll be stretching and reaching upwards. It is recommended that you wear clothes that aren’t too restrictive, but are not excessively baggy for yours and others safety. All you need to bring is your sense of adventure and a whole host of enthusiasm! We will provide you with a harness and helmet (only required for a few challenges). There is a spectator seating area so anyone with you who’s not getting involved can hang on to your belongings; however, we also have small secured lockers available for you to use. Can I go on GoClimb if I have a disability? I’ve been on climbing walls before, why is this any different? Forget your traditional artificial rock climbing wall experience. That just seems too one dimensional compared to GoClimb! We have over 20 different fun themed walls to climb, plus a parabolic slide and other obstacles. Each vertical platform presents its own unique challenge that the climbers can enjoy. Remember, it’s not just for kids! All of the family can enjoy and have fun on GoClimb. Yes, we have fully accessible toilets, shower rooms and facilities for baby changing. We advise that you go to the loo before you start your activity to not interrupt your enjoyment and prevent any unnecessary taking off and putting on of harnesses. We have a number of vending machines within GoClimb offering a selection of drinks and snacks. For those looking for a little more there is a café on site serving hot food, confectionery and light bites, so there are plenty of opportunities to refuel before or after your session. Food and drink are permitted in the spectator seating area, but not within the climbing activity area itself. Can I book a birthday or privately hire GoClimb? Yes, absolutely! GoClimb must be one of the best parties ever, where the birthday boy or girl can be joined by 23 other friends. 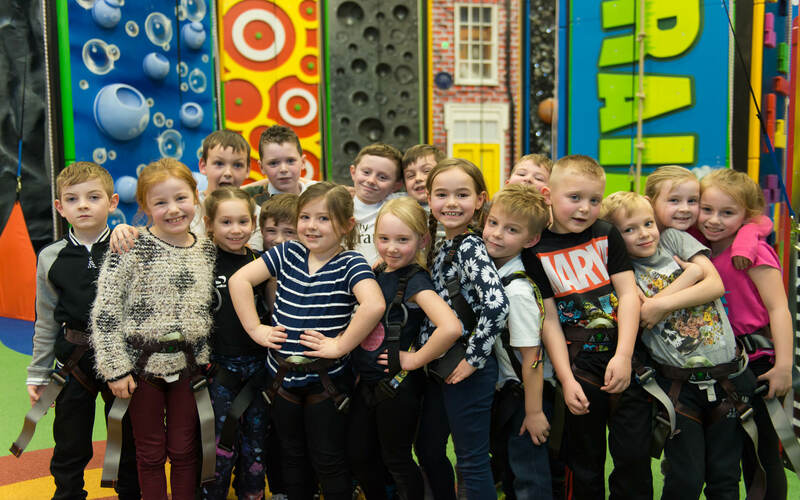 School kids love climbing as well as big kids (adults), so we offer a variety of options for birthdays, school visits hires and even corporate days.